By now, you sure know that—thanks to Intel chips in Macs and software such as Parallels Desktop ( ) and VMware Fusion ( ), you can run Windows software on your Mac. But you may not know the answers to a bunch of other related questions: Why would you want to put Windows on your Mac in the first place? Which Windows programs are compelling and unique enough to justify the hassle of putting Windows on your Mac? Can you really incorporate those programs smoothly into your Mac workflow, or will they always feel clunky? In other words, while putting Windows on your Mac might sound great in theory, how does it all work out in reality? For some answers to those questions, we offer this series. We’ve got advice on how to prepare your Mac for Windows, how to set up Windows itself, and how to efficiently run Windows applications side-by-side with your Mac-native software. We’ve also got recommendations on great Windows applications that don’t really have good Mac alternatives. Maybe you know some of this already. We bet you don’t know it all. Obviously, only Intel-powered Macs can run VMware Fusion or Parallels Desktop. Both will run just fine on anything from the first Core Solo–powered mini to the newest eight-core Mac Pros. Neither program specifies a minimum clock speed, but—no surprise—the faster your Mac, the better your Windows experience will be. That said, even my original 1.66GHz Core Duo Mac mini does fine running basic applications (such as Microsoft Office), in both Parallels and Fusion. Though a Core Duo Mac mini is not the best Mac for running Windows Vista, it's surprisingly usable if your expectations are realistic. While each application will run with as little as 512MB of RAM, each prefers 1GB, and if you want the best Windows XP experience possible, you’ll need 2GB; if you’re running Windows Vista, 3GB is preferable. As for disk space, you’ll need to set aside at least 2GB on your hard drive for Windows XP, but that’s just for the operating system itself. You’ll also need to make room for any Windows applications you install and any data files they generate. Vista requires, at a minimum, 15GB of disk space, but its documentation recommends 40GB. Vista is the official current version of Windows. But you can still find Windows XP for sale out there; until very recently, XP Pro was what I always installed on my Macs. If you want to stick with the official current version of Windows, you can get Vista in Basic, Home Premium, Business, and Ultimate editions. Microsoft provides a comparison table that makes it easy to choose the right version. Basic is too bare-bones to consider. for a home user, Home Premium is an affordable yet reasonably powerful option. For office users, Business is the logical choice. If you’re the type who simply must have the best of everything, go for Ultimate. For my needs, Business—with its comparatively full feature set and affordable upgrade cost—works just fine. No matter which version of Vista you choose, you’ll probably run into some of its well-publicized annoyances. 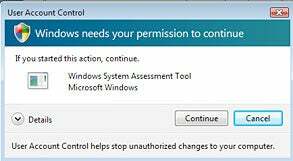 Our sister publication, PC World, did a good job of summarizing them and providing some workarounds—including one for the annoyingly persistent User Access Control dialog boxes. Neither Fusion nor Parallels currently supports Vista’s resource-intensive Aero visual effects. This is actually a good thing, because it reduces the load on your system. If you're planning on running Vista, get used to seeing this dialog box, the equivalent of the OS X authentication dialog. Installing Fusion or Parallels is easy. If you’re installing Windows on your Mac for the first time, that’s also relatively simple: Parallels and Fusion both include installation wizards that automate the process for you. Just make sure you allocate enough drive space for applications and data, as well as for the operating system itself, when you create the virtual machine. If you do, the process should be fairly painless. If, on the other hand, you’ve used Fusion or Parallels before to run earlier versions of Windows, upgrading to Vista can hurt a bit. The degree of pain will depend on the version of Windows you’re upgrading from and the version of Vista you’re upgrading to. Certain combinations require a clean upgrade, meaning that you’ll have to wipe out all your old data. Others allow an in-place upgrade, leaving your data intact. 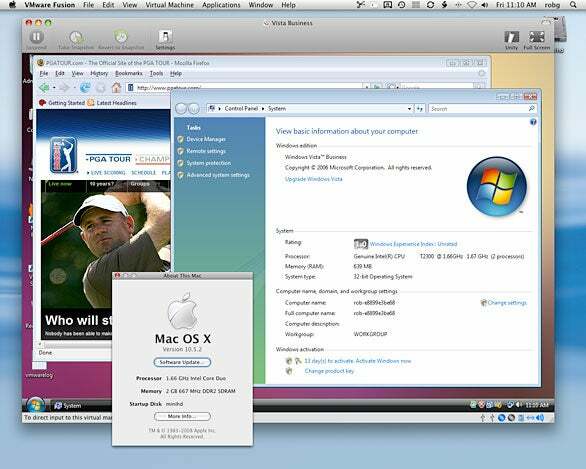 (Unlike OS X, Vista doesn’t offer a clean install that keeps users and settings.) The Upgrade Paths page at Microsoft explains the permutations of the problem. For me, the biggest problem was expanding the size of my existing virtual machines (meaning the space on my hard drives devoted to Windows and its applications). I’ve always kept those relatively small—under 10GB—because I use only a couple of Windows applications and I don’t create massive data files. But, as noted, Vista wants a lot more than that.